Ruth Ann (Hopper) DeWind, 80, of Berrien Springs died at home on Tuesday, September 18, 2018. Ruth was born March 14, 1938, in Gobles, Michigan, to J. C. and Barbara Hopper, the eldest of five children. She worked as a hospital clerk before her marriage to Frank DeWind of Jenison, Michigan, in March of 1957. The couple had eight children, 12 grandchildren, one great-grandchild, and another great-grandchild on the way. Frank and Ruth lived in Jenison and Hudsonville until 2016, when they moved to Berrien Springs. 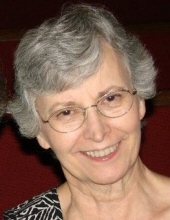 Ruth was a member of the Stevensville Seventh-day Adventist Church. Ruth excelled at baking, knitting, crocheting, and sewing, creating countless beautiful and well-fitting garments, toys, and quilts. She loved to read and spent hours each day in devotional study and prayer. She constantly sought new pathways of knowledge and cared about the spiritual well-being of everyone she loved. She was preceded in death by her parents and her son, Thomas J. DeWind, who died on September 8, 2018. Ruth is survived by her husband, Frank DeWind; her daughters: Annette DeWind, Natalie (Joe) Marocco, Amy (Randy) Hubble, Lynell DeWind, Jennifer (LeRoy) Ward, Rebecca (Sean) DeWind Mattingly, and Leah (Trent) Bowen, as well as her daughter-in-law, Sally (Hammond) DeWind; grandchildren, great-grandchild; two sisters: Jean Wagner and Mary Beth Sumner; two brothers: Jim Hopper and Dennis Hopper; and extended family members. A memorial service will be held at 11 a.m. Friday, September 28, at the Stevensville Seventh-day Adventist Church, 6657 Stevensville-Baroda Rd, Stevensville, Michigan. Final interment will be at the Georgetown Cemetery in Hudsonville, Michigan. Online messages can be posted at www.allredfuneralhome.com. To send flowers or a remembrance gift to the family of Ruth Ann DeWind, please visit our Tribute Store. "Email Address" would like to share the life celebration of Ruth Ann DeWind. Click on the "link" to go to share a favorite memory or leave a condolence message for the family.